It's not often I use this blog as a sounding board. But there's an opportunity here to be interactive as well as informative, that's too good to miss. The Leeds Community Enterprise Accelerator, known as Elsie, has been going for a year now, and needs its momentum built further. The forum (website currently http://leedscommunityenterprise.wordpress.com/about/ – will be revised) uses trained volunteers from all walks of life to give free advice and ideas to businesses, third sector groups and other enterprises. It's been described as "Puff the Magic Dragon's Den", which I rather like. So how do we build it further, with more enterprises (clients), more activity and greater impact? There's a technique I've used a lot known as strategy mapping. It's often used to develop Balanced Scorecards but its applications are much wider. It's basically a diagram that illustrates the intended outcomes for various stakeholders, and what the organisation does to generate those outcomes. Simply described, it shows cause-effect linkages, or 'what works' if you like. Shown below is a draft – and I do emphasise draft – strategy map for Elsie as it currently exists. I'm sure this can be refined, but the aim is to understand what is working well and what needs improvement. Have we got the components and linkages right – is this how Elsie really works? Are we clear enough on how Elsie benefits its volunteers, not just its clients? How can we promote the benefits so that Elsie gets a steady stream of new projects to advise? 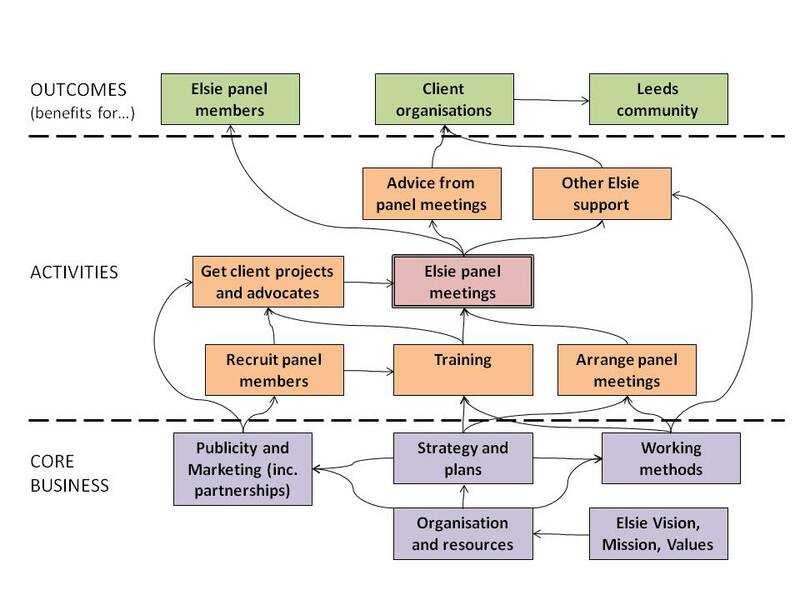 How can we assess the impact Elsie is having on the wider Leeds community? Turning a strategy map into a Balanced Scorecard involves developing performance indicators for all of its components – outcomes, activities and core business. I'm not proposing to do that now, but would welcome feedback from anyone on the strategy map itself and questions above. You don't have to be an Elsie member to respond. Let me know what you think and how we can develop Elsie to make a real difference.